Perennial underdog Leicester City has won the English Premier League for the first time. Leicester drew 1-1 with Manchester United on the weekend, but was awaiting the result of the Tottenham-Chelsea contest to see if it had enough points to win the league. Tottenham and Chelsea drew at two-all, which gave Leicester enough points to take the title. 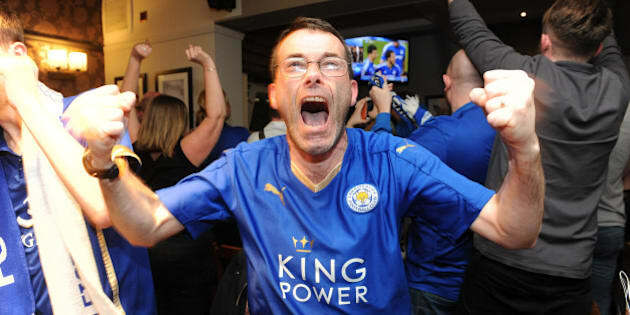 Leicester fans realise their team has enough points to win. In the team's 132 year history, the closest it previously got to winning was runner up in 1928-29. It's a surprise triumph for a team that started the campaign with odds to win of 5,000-1, which the Guardian reported was taken up by 12 punters at betting agency William Hill, including a 39-year-old Leicester carpenter named Leigh Herbert whose £5 bet was now worth £25,000. The football fairy tale is spreading on social media like wildfire. Leicester teach a very important lesson. The rich and powerful can be beaten. What a year its been for football's traditional "minnows." Leicester win the league and Rangers make the Scottish cup final.